Moto E3 stock got out of order at Flipkart by next day after its sale started on 19th September, 2016 at 23:59 hrs IST. 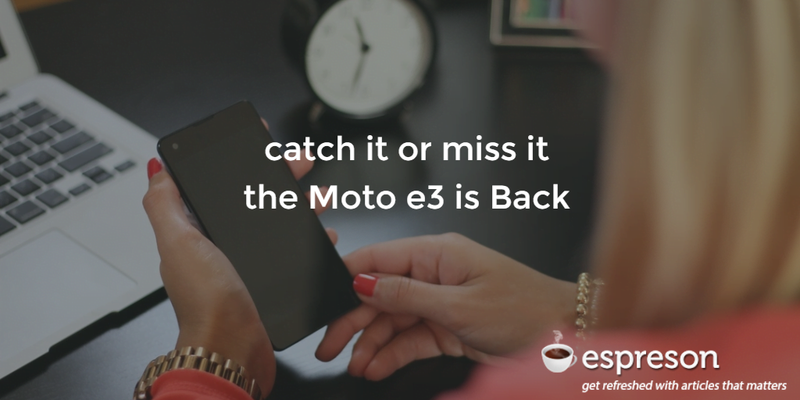 With overwhelming response from smartphone buyers around India, the sale of Moto e3 will resume from tomorrow i.e. 26th September, 2006. This time you have to put your alarm on, because the sale will start from 23:59 PM onwards. But, this time no freebies offer from Flipkart or Motorola right now. Till now, the phone bagged good quality positive review of rating 4.3* at Flipkart. How long the sale will exist this time? Till stock lasts or don’t know. Last time the response was awesome, as per Flipkart. So, that’s why Motorola is putting back its stock on Flipkart. Would you put alarm on? On 26th September, 23:59 PM the sale will start. So, it’s up to the crazy people who dare to put their alarm on to catch the Moto fever. Next: Next post: Do you need to be expert to Increase WiFi, 3G, 4G Speed?